It’s not less known fact that GoDaddy is one of the most reputed brands when it comes to Hosting and Domains. To gift Indian customers something extra, the tech giant has launched a bunch of exciting offers. 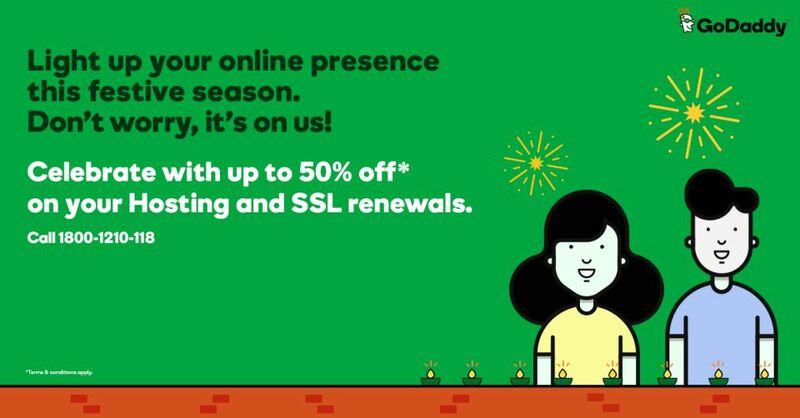 In order to Light up your online presence this festive season with GoDaddy, the company have launched up to 50% off on all hosting & SSL product purchases. WordPress and SSL certificates products. The company had announced ‘Customer Give Back’ program last month and it arrives as a part of the same. On the top of that, the offer is valid for existing and new customers as well, which means renewals will also get the opportunity. GoDaddy Toll-free customer helpline number 18001210118 is dedicated to assisting customers in availing the offers. businesses in India realize the benefits of creating a professional online presence.